Charles Mortimer, with Ian Fleming (centre). Dundee Courier - 1 October, 1935. 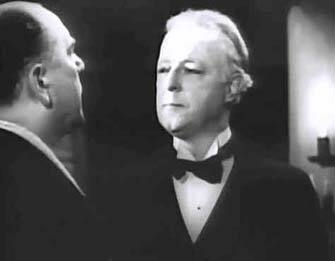 Arthur Wontner plays the leading role as Sherlock Holmes, and Ian Fleming makes a convincing Dr Watson. The strong supporting cast includes Lyn Harding, Leslie Perrins, Jane Carr and Charles Mortimer." Newspaper article from the Evening Telegraph, on the 28th of September, 1935. Article from the Courier and Advertiser of 1 October, 1935. 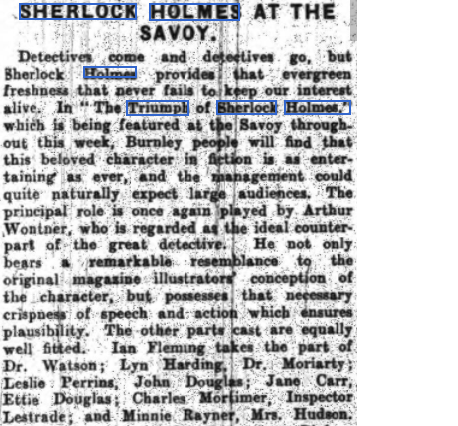 From The Burnley Express - Wednesday 11 September 1935. Let it be said that the Criterion died game! It strides out of Times Square (closing Sunday night) with a smile on its facade and Sherlock Holmes on its screen. Its last picture, "The Triumph of Sherlock Holmes," with Arthur Wontner in the title rôle, is a mellow, evenly paced British film that renders to Holmes what Sir Arthur Conan Doyle would have rendered to him: Interest, respect and affection. Again we find the sinister Professor Moriarty at large, this time in the service of a secret organization which is seeking revenge upon one of its former members, John Douglas. Holmes is lured out of retirement when the murder of Douglas—by that delicate weapon, the double-barreled, sawed-off shotgun—gives him an excuse to match wits again with Moriarty. Dr. Watson is around, of course, muddling through the clues, announcing his theories and waiting patiently for the dénouement which will permit him to exclaim, "Marvelous, Holmes!" Finally, Holmes assembles a dumb-bell, a candle, a pair of slippers, an umbrella and a suit of clothes and converts them into a bludgeon which topples Moriarty from his criminal throne. That is Holmes's triumph. Mr. Wontner decorates a calabash pipe with commendable skill, contributing a splendid portrait of fiction's first detective. Lyn Harding is capital as Moriarty and Roy Emerton, Leslie Perrins, Ian Fleming and Michael Shepley perform competently. 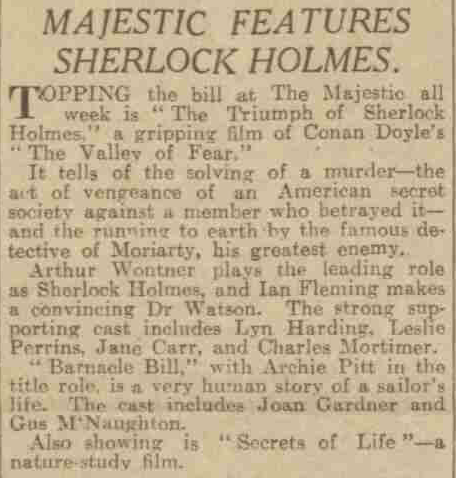 THE TRIUMPH OF SHERLOCK HOLMES, based on the story "Valley of Fear," by the late Sir Arthur Conan Doyle; adaptation by H. Fowler Mear and Cyril Twyford; directed by Leslie S. Hiscott; produced by Julius Hagen; presented by Olympic Pictures. ​The (talking) thirties had, naturally, a growing pool of experienced film actors. 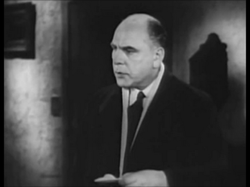 While the performances are limited by that traditional focus on Holmes and his villain attributable to William Gillette's influential play, seasoned actors like Philip Hewland & Charles Mortimer ( for Wontner) and Alan Mowbray (for Owen) brought considerable stage and screen skills to what remained two-dimensional Inspectors.